There are 8891 posts in this topic. You are on page 12 of 178.
i am not one to wait on lines it just something i refuse to do. couldnt get to play houdini but i was standing on side lines watching. to me it looks and plays pretty good and i wouldnt mind one next to my TOM. guess ill have to find somewhere to play it when its done. love the theme, art, cabinet and pop bumper chains. Houdini is one that i will probably get, and I have liked everything i have seen so far, until the LED T-molding, thats ugly and i really hope that they do not do it. Its one of those things that will actually make me consider getting the game. I was going to not comment on this, but . . .
Just like here in this thread, this concept is not universally loved here at AP. So, I'd say, despite what was said at PAGG, I would not consider this as a done deal as far as being included (improving playfield lighting will certainly happen). Personally, I am pushing it for being an add-on. If we went that route, I would still code for it, so it is interactive with the game, meaning dimmed during game play, turning yellow then red when a timer is running low, flashed when appropriate as part of a lightshow, etc. 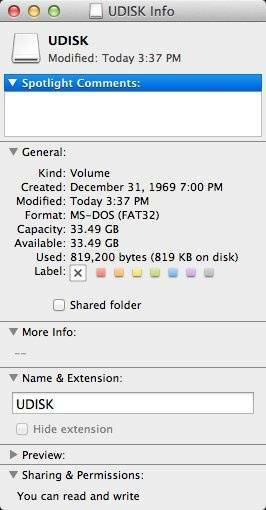 If it is included, we would certainly offer an option to disable it (e.g. always off, only in attract), it could also be easily replaced with other T-moulding. Played the game at PAGG several times. 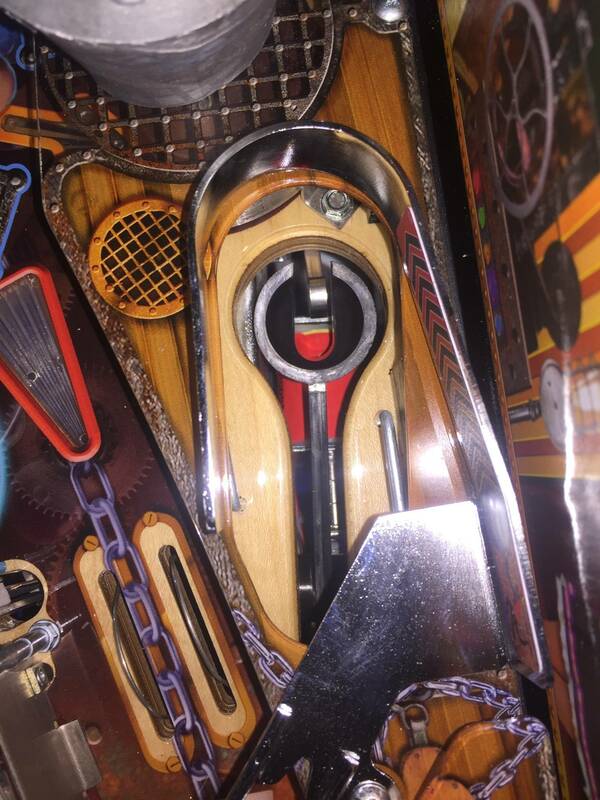 Loved the catapult, pop bumpers with chains, the great artwork. The game looks great in person, much better then when you see pictures of it in my opinion. The tight inner right loop that feels great when you hit it (please please do not widen it! I understand that it is being considered possibly.). Thanks for the tshirt and letting me play such a great game. Forgot to mention, awesome code Rosh! And I say Please AP leave it On the game! Seriously, they offer a simple "turn the feature off" if you don't like it. Sounds simple enough? Why are we recommending they remove or skip value added features because a few don't want to Turn it off?? As a deposit holder and Confirmed buyer please stand true with your build plan and don't let individuals force their personal wishes on the wishes of All. Love this title and what I have seen thus far. While I've been pushing for it, does not look like we will be there this year, with what we have going on at that time. game at PNW will likely be the same machine. 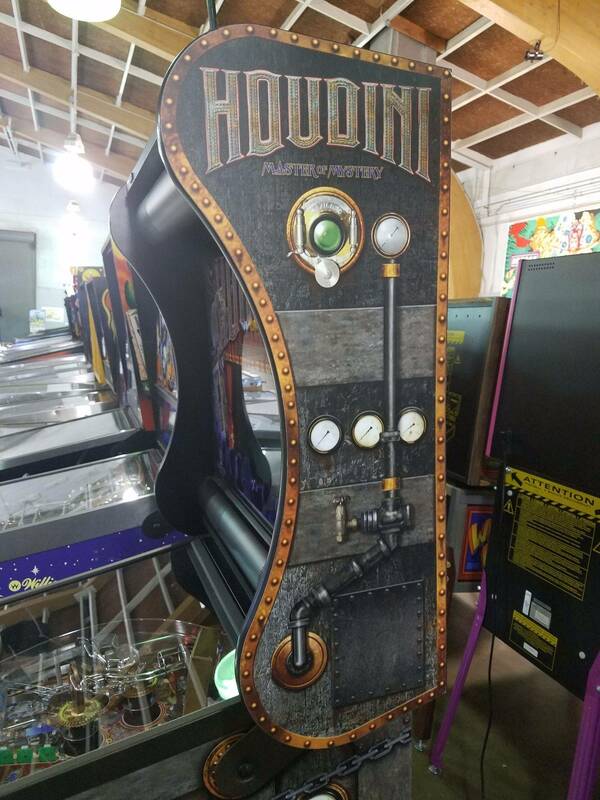 We are working through some changes to the ramp and playfield, but machines with the changes are not likely to be ready in time for PNW and SFGE. Shame you won't be in New England next month. 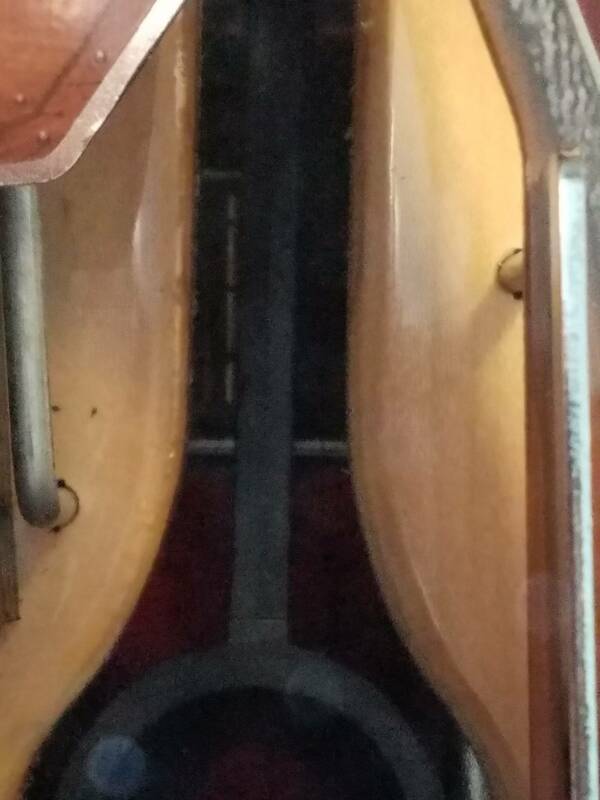 Got in a two 2-ball games at Pagg. * clip art on backglass is very clip arty in person. while layered art concept is GREAT. execution is: "Please hire an artist to do this by hand" -- it feels very 1994 print-shop. My bottom line is -- I TOO am impressed that ANY company can get this far in producing a good game. 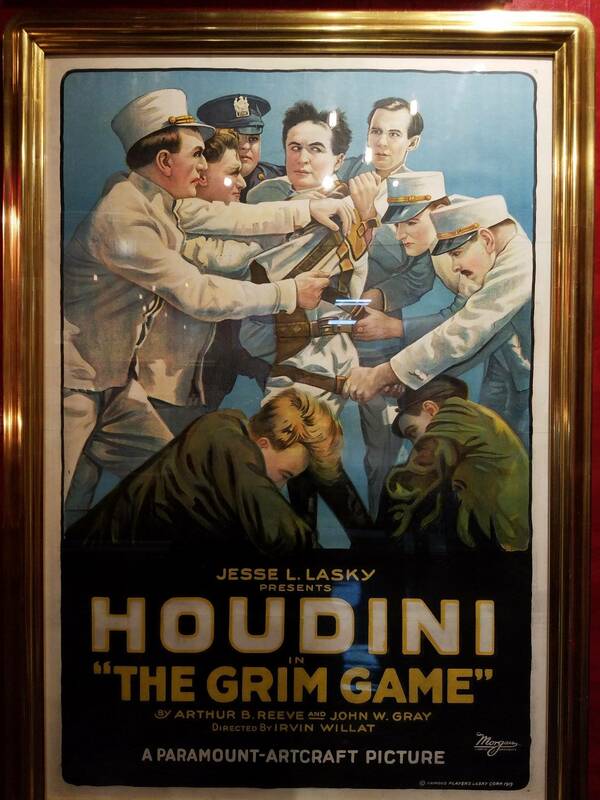 People are excited about Houdini, and I'm pleased by that. I want them to succeed. I didn't get in enough time to declare the geometry it a hit or a miss. The relentless stop-n-go of moderns must be flipper-button-escape-able in order to play them... period. Seven word review: Keep refining every aspect of this pin. Not next month lol the show is in July. Don't scare me. please please do not widen it! I understand that it is being considered possibly. Best story I heard from PAGG, was a guy played the game the first day and had a short game, struggled to hit the shots, came back the next day and a huge game (12 minutes he reported), easily and consistently hitting the inner loop, the ramps, etc. . So he turns to Jim and says, not sure what you changed last night but it is like a totally different game, I can make all shots . . . ', so Jim replies, nothing was changed. Obviously I play the game a lot (talk about a huge understatement), sometimes I can step up and hit that inner loop, ramp, etc. consistently and sometimes I can't hit anything. But that is what makes this a game you want to come back and play. It challenges you, where with some games, every shot is easy and flows and that can get monotonous and boring. In general, it did sound like you west coast guys had no issue hitting that inner loop shot, but some struggled with the ramp, seems the many of East coast players struggled with the inner loop but had no issue with the ramp. As I like to say, it is a mental thing, It is easy to psych yourself out on how narrow it is and just not be able to make it. Those who don't think about that, lie kids, have no issue hitting it. We will improve lighting in the lower half as well a some spots to better light the stage and the trunk. Not helping right now is that the inserts in the chain links are amber, not clear as they should be (we could not clear in time for the first prototypes), so that makes even those inserts darker then then they should be. This six speaker sound system is great, you will really like it when you get to hear it in a better environment. 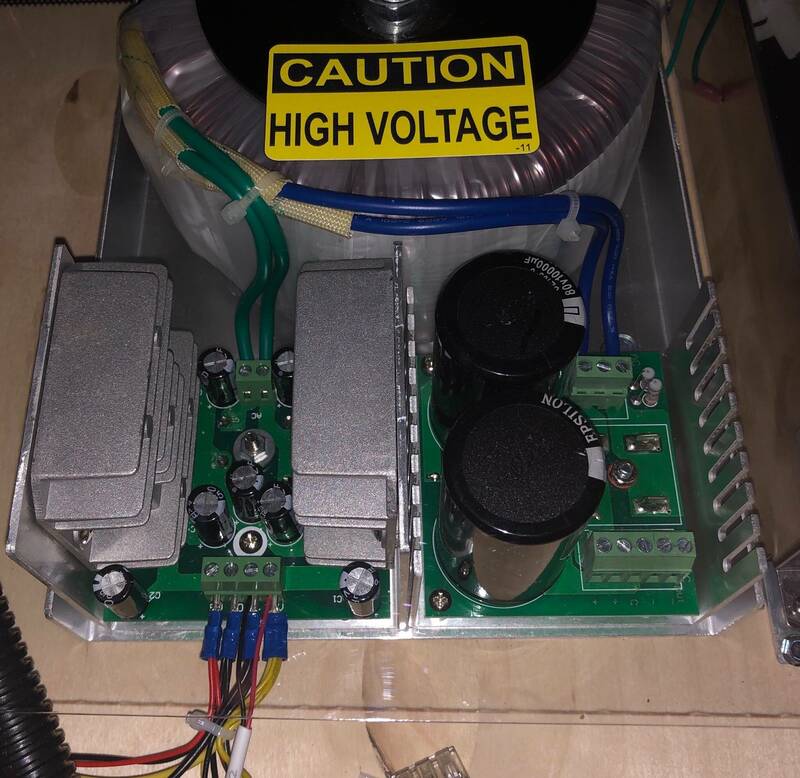 That prototype also does not have the correct amp in it yet. Part of that is the factor of the mode nature, part of that is wanting to tie in the theme, regardless, some of the features already have a flipper escape or speed up (e.g. secret missions, jail escapes, bonus), and I'll be adding flipper escapes in most places. Thanks, I'm pretty pleased with the defined rule set, and considering the code is only 29.87% finished, it is playing pretty well. Real happy with how the main score screen came out. Needs a few tweaks. Some of the animations are basically done, some are part way implemented and some are nothing more than place holders. Challenge is I have to design/storyboard all of this before the artist and animator can do it, and often I then have to do part of the animating. The large, high resolution screen really increases the amount of work vs a traditional DMD. Seen it a thousand times, does not seem to get old. Rosh, I just wanted to say a sincere "Thank you" for taking the time to post in this forum. It's been REALLY fascinating to hear your updates on the evolution of this game. I'm really looking forward to receiving mine when it's released. I'm sure I speak for a lot of people when I tell you that hearing all of your stories, anecdotes, and trials & tribulations regarding bringing this game to life really makes me feel like I'm part of the journey, and the stories I'll have to share will make the game even more special when it arrives. So, again... "Thanks!" Well I was hoping for 29.91% but this is still very impressive for 29.87%. My friend's roomate's cousin's sister was in the Buffalo Grove Lou Malnatis last night and overheard Gary Stern talking about the code in between slices. Apparently he sounded pretty worried. "AP's 30% code is our 110% code!" Really enjoyed the short time I had with this game at pagg. Funny, classic callouts for sdtm. Some really satisfying shots(when I wasn't crushing the posts) and good looking art. I'm thinking this will be a must own for magic fans. We played a nice tom that was at the show quite a few times, and I think this game hits that same vein. But when is full production line up and running and how many a week get made? 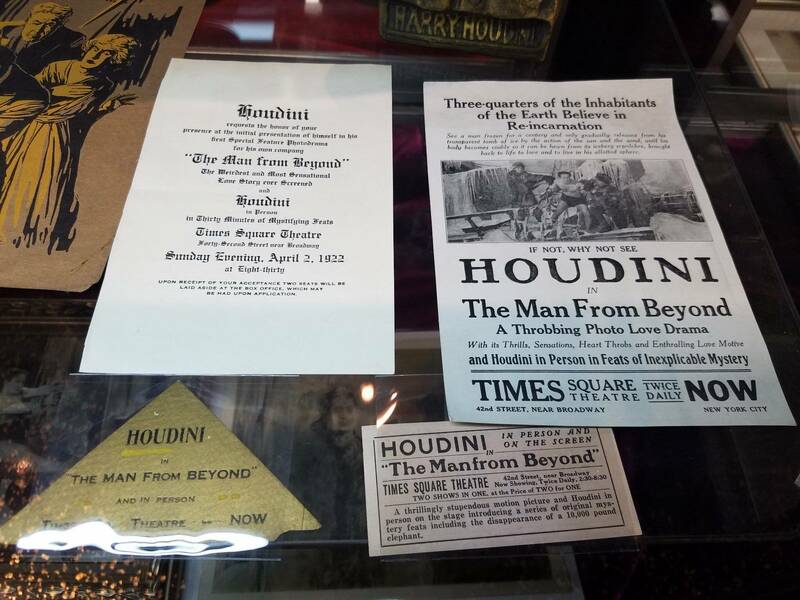 Houdini didn't believe in psychics and neither should you! 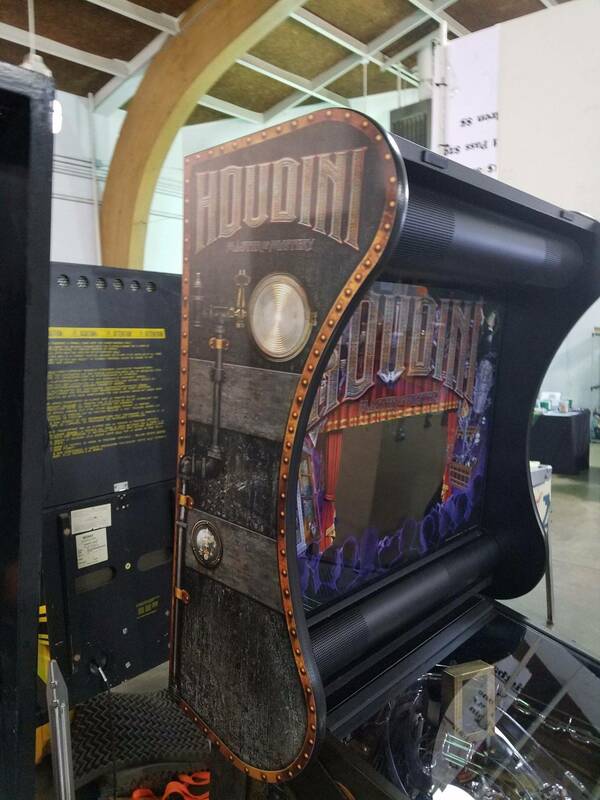 Flip N Out Pinball will have one at SFGE this coming weekend. Come check it out! Things are quite busy. We have two shows this week so I have been squeezing in some new stuff and working through code issues. We have been adding staff to engineering and production teams, and are in the process of getting the factory re-worked. We have some more prototype games being finished and will soon start on a set of sample games. It is still our goal to have machines rolling off the line by end of year. That is obviously a huge challenge and an aggressive goal, but as the head coach of my favorite football team likes to say "if folks aren't laughing at your goals, they are not big enough!". As far as how many games per day, there is an old saying in business forecasting, "give a date or give a number, never give both". Hopefully I will see some of you in Atlanta this weekend. 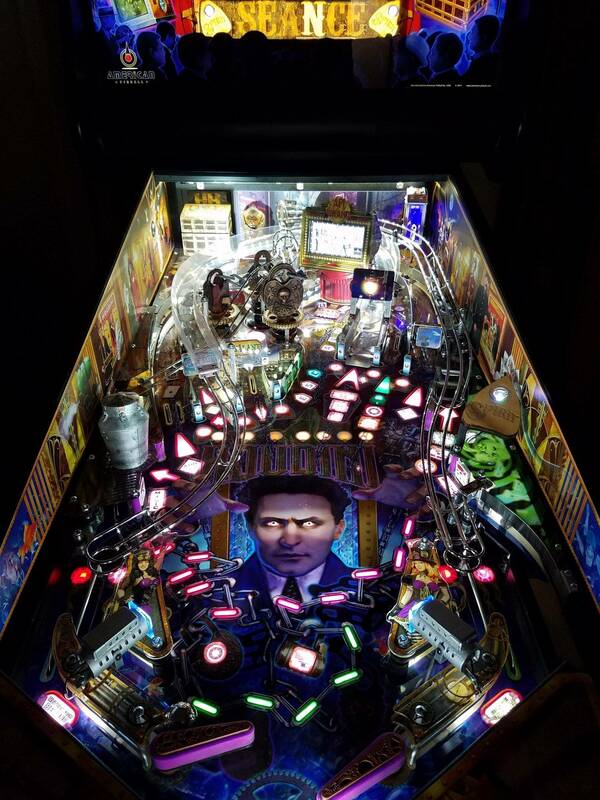 Joe Balcer will be up at the NWPinball show as well. You will Def. see me , I cant wait to check this out!! Maybe this has already been covered but what is the price point going to be ? Are there limited numbers ? 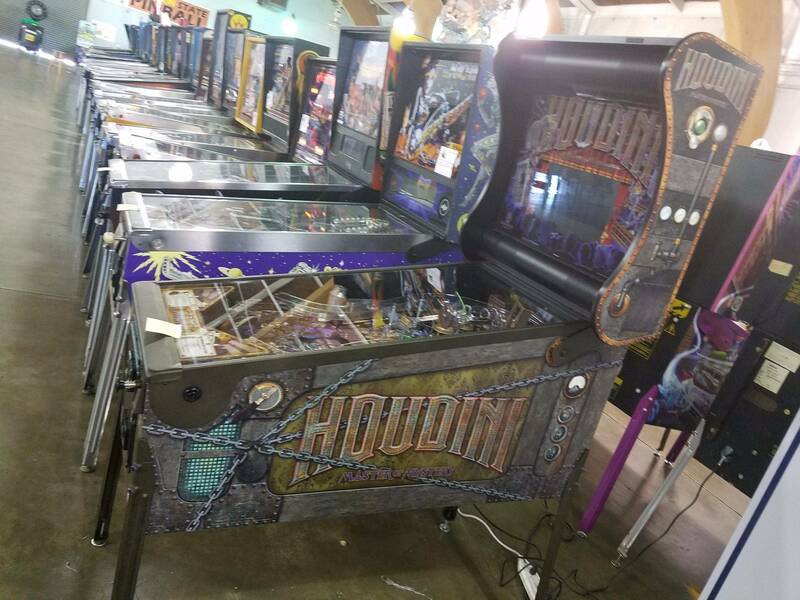 Will Joe have a game at the the NW pinball show? Yes, which at this point is a well traveled machine, having been to Texas, Milwaukee, Allentown, Dixon and now NW. The plan is for it to get updated code, however, we will disable some modes for the show. rosh any chance we could get a video where you can clearly hear the sounds in the game? Sound design is an important part of a machine for me, and I've yet to see any videos where you can clearly hear what it would be like to play the game in a home environment. any chance we could get a video where you can clearly hear the sounds in the game? Sound design is an important part of a machine for me, and I've yet to see any videos where you can clearly hear what it would be like to play the game in a home environment. It is on our list to do, hopefully after these next couple of shows we can take some time to make some quality videos. Of course not even sure a video can properly capture the sound quality, but certainly better than a video shot at a show. I'm pretty happy with the audio so far, however, we are also far from getting the sound package fully implemented. Lots of cases were modes should have their own track, but are still using of the main tracks. Lots of missing sound effects, fanfares. flourishes and the timing and ducking on many of them that do exist need to be tweaked to get the right balance and timing. And we have still only done the first set of sound calls. read this idea on a pin board here in houston. it's interesting. Hoping Houdini "breaks the layout mold"!!! 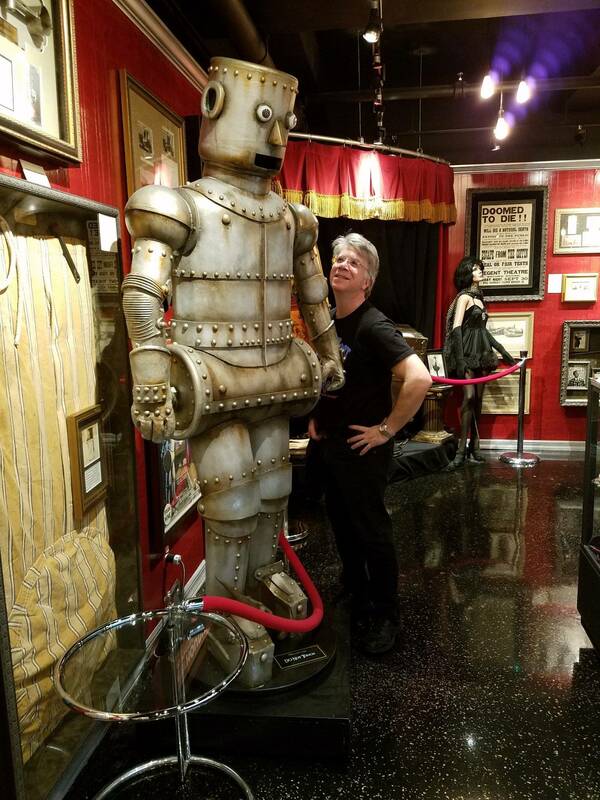 "I heard there was a discussion about how the new Star Wars playfield is like the AC/DC playfield." In the post he compared them in pics and they are almost exactly the same. I have seen very little that compares to Bally/Williams. Looking forward to playing this at SFGE! Finally a new pinball company leader that isn't overpromising. I applaud your candor and the frequent updates without over committing. Very refreshing. I'm looking forward to playing the game somewhere so I can decide whether to buy one. I know you're not getting to Pinfest in MA. Other than the NW show, any other options this year? Sounds good, thanks for the quick answer. Looking forward to it! Other than the NW show, any other options this year? Waiting to hear from Jolly, distribution guy, what the second half of the year will look like. Pretty confident we will be at expo. I wish I could make it to the Atlanta show, but hopefully it will appear in Orlando at IAPPA and/or Freeplay. had made....it was a Present. 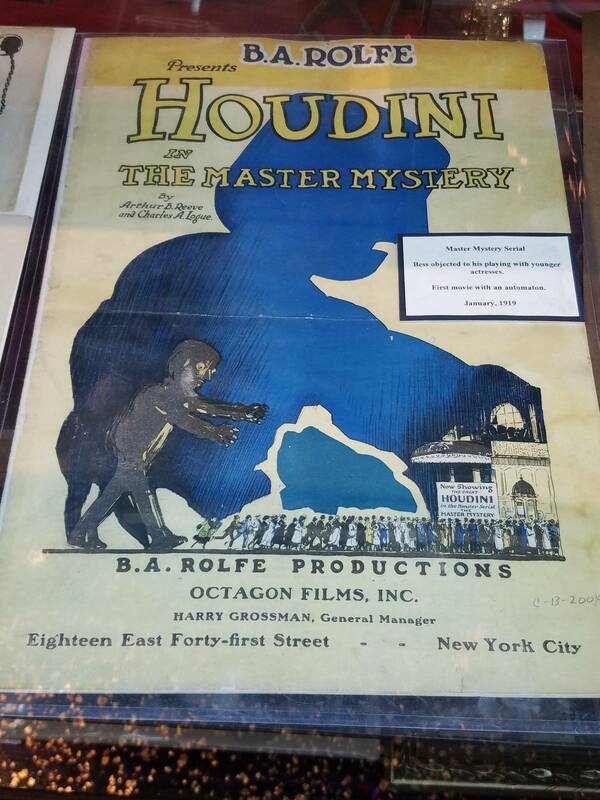 For me, one of the best Reads on Houdini, and I highly recommend it! Merry Christmas to me! 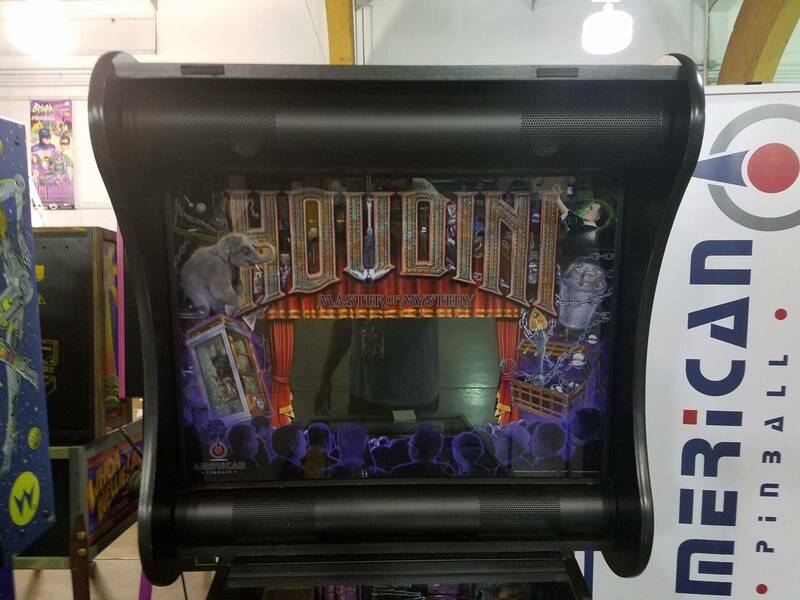 I placed my deposit for my 1st NIB this weekend with Joe at PinballStar who was kind enough to bring The Houdini team to Allentown. Could be like one of those Stern boxes and just fall out. You never know. 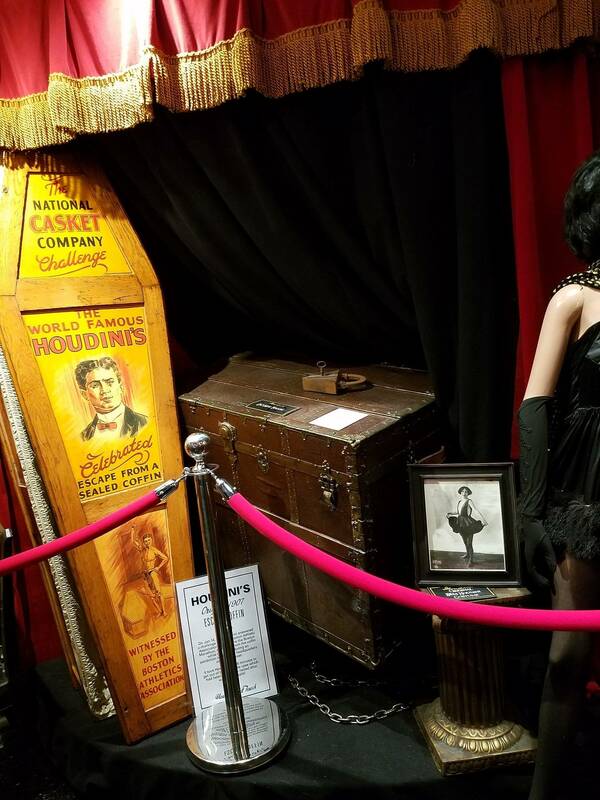 A bit off topic (though I already have my deposit in for the Amazing Houdini!) but I was wondering why grand new releases like this don't consider setting the game up for .50 cents (ish) per play at these road trip unveilings to donate to their favorite charity? Not saying that would die down the lines any but the unveiling and attraction of a New spectacle such as this would probably draw a nice gift for children and who would frown on giving .50 to a charity?? Again, Just Asking if this type of opportunity was ever done? Seems like it wouldn't be horrible for a start up company to start with a tax deductible donation to a good cause...Just a question not a demand nor am I promoting Any charity. 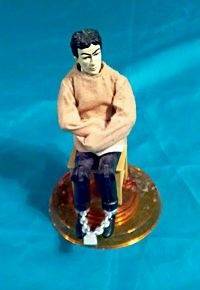 That figure is an action figure made by a company called Accoutrements, who does all sorts of historical figures. They are pretty hard to find these days since they are a one time release, and can be a little pricey since they are a collectors item. I did find one that was not too expensive since it was in damaged packaging. I keep it on a shelf above my computer as inspiration and a reminder to do right by Harry. 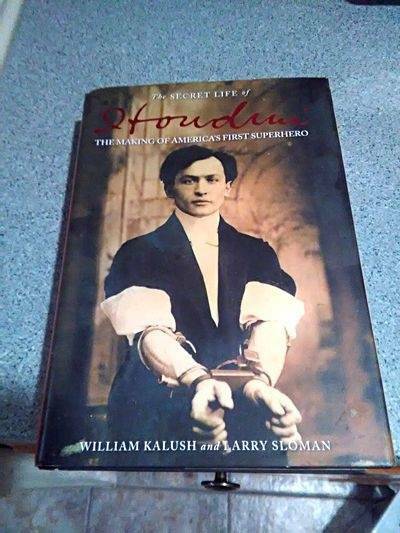 There are three new houdini movies in the works, one of which is based off of this book. Hopefully it will be more accurate than the others. some info on the others here . . .
As soon as I typed that, I had to double check the packaging to make sure it was not a subconscious thing, since I am considering using it for a topper (having him hanging upside down in front of the backglass). Was wondering how long it would take someone to pick up on that, looks like it took a whole 10 minutes. And great idea for a topper! Ut ohh, here goes the mad rush to find these. Since I played this amazing game at Pin a Go Go a few weeks ago, couple things came to mind. Been thinking 1/6 scale water torture tank. Similar but athentic, to say walking dead topper but the tank. Second...it was early Friday morning of show, no ones around, ive been staring at this thing for 10 min...thinking. "Its not even on, and I'm Sold"
"This is going to cost me money!" Look forward to getting it, hoping by Christmas. 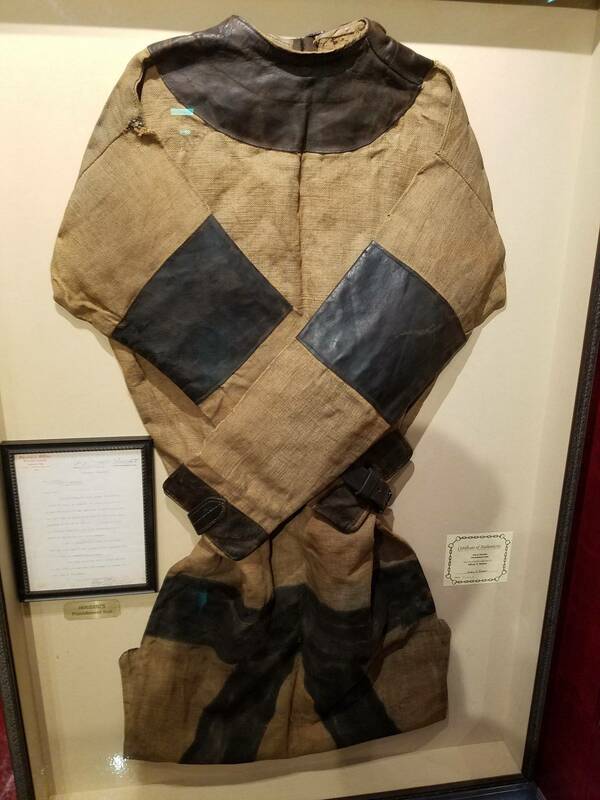 Originally on the playfield where we have the planchette (the quija board pointer) we had thought of a having Houdini hanging in straitjacket over that scoop shot, but Matt from Back Alley convinced us that given how small he would be, he would look more like a caterpillar in a chrysalis. That is when I decided that a hanging Houdini would be a great topper. 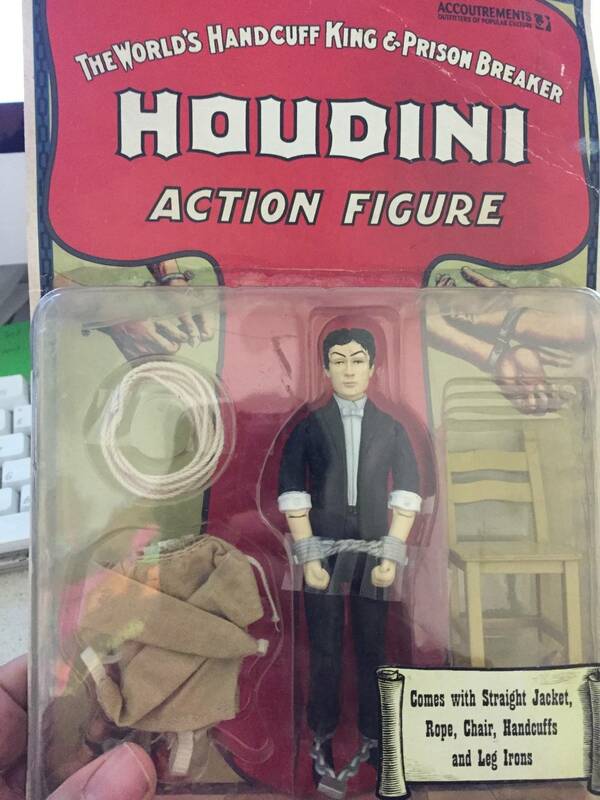 I do have to say I was surprised to find that there was a Houdini action figure. 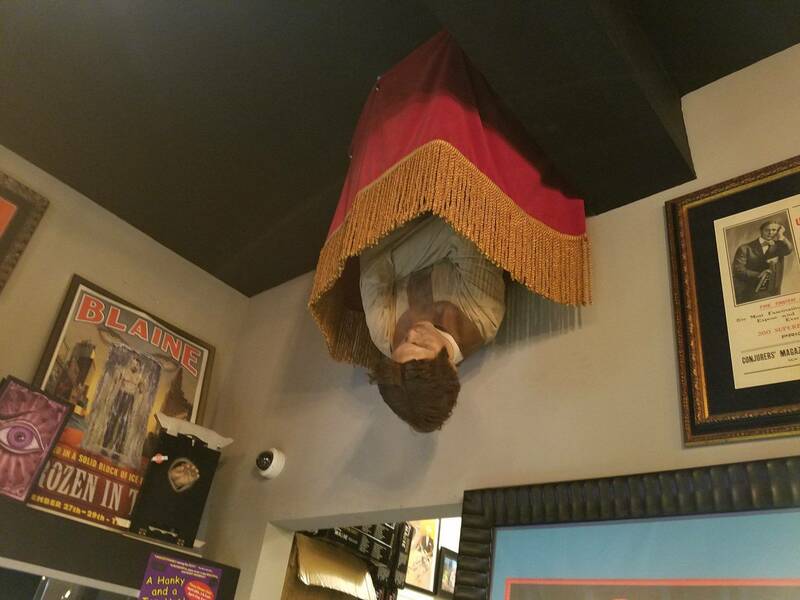 That is when I decided that a hanging Houdini would be a great topper. Any chance you can have him swinging as you nudge the game? Top it off with it acting like a tilt bob and if he hits the side, he lights up. Your reading my mind! I can see a Bumbling Water Torture Topper, or a Hanging Houdini in a Straight Jacket and a Spotlight with a city Background! Rosh, will there be a Topper from the Company, or have you worked with Joe on something? Thanks for the heads up on a movie.....I hope its True to this Book. Ive read every book on him, and this one is by far the most accurate. If your getting this game, grab this book! She complained repeatedly that he was a mean person to her sometimes....his "Ego was bigger than the door he walked through", was how she phrased it. How cool to see that come back....Brilliant idea! Make it so! It is something we have talked about, but have not made a decision on. More important things on the agenda right now. I think there is little doubt he will swing, but as you can tell from the unopened package I've not tried it yet. As far as a tilt, pretty funny idea, and would not shock me to see someone do as an after market thing, now that you have suggested it. 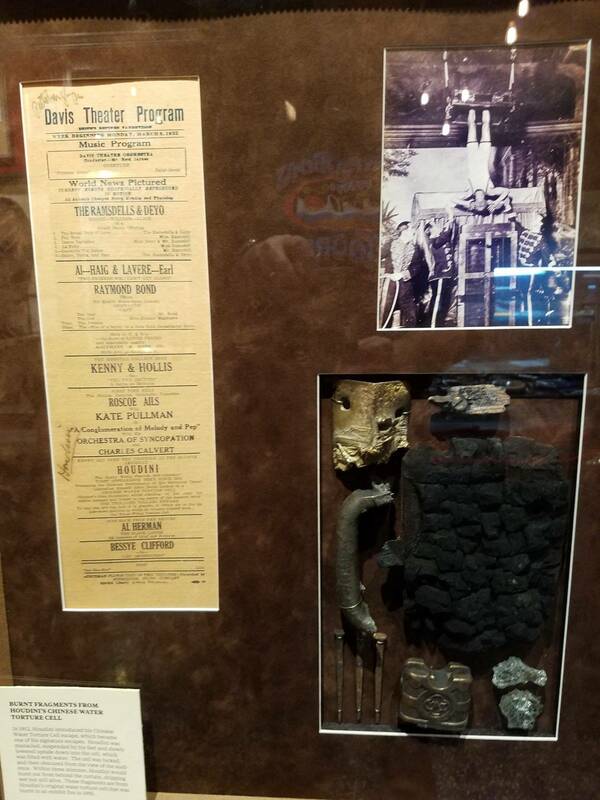 Of course they would need to find or create houdini action figures first. Bangerjay had done a tilt bob helmet for his olympics. Where the tilt bob was suspended from a helmet a foot in front of your face, and you had to hold your head still to not tilt. I watched my buddy CraigC play a 10 minute game and never tilt, and I could not last 15 seconds (of course I was drinking tequila).